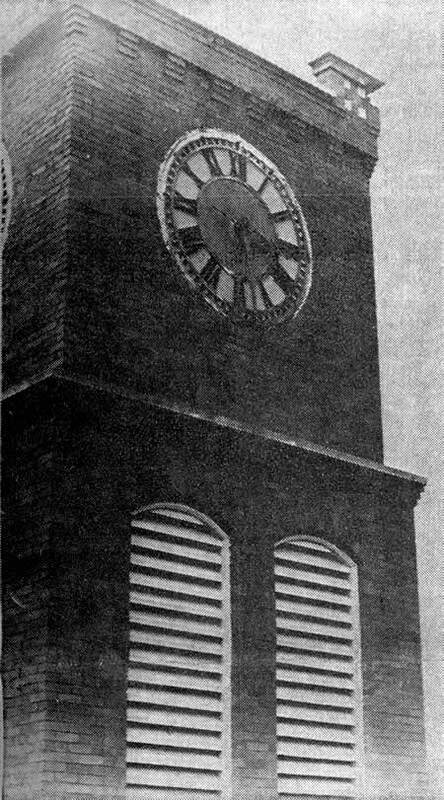 In 1969 Cliffside’s own Troy Houser, then editor of the Forest City Courier, wrote this anniversary story and made the photographs of our town clock. “Ninety years without slumbering . . . tick-tock, tick-tock,” the songwriter wrote. And his words were describing perhaps an old grandfather clock which he had most likely watched, spellbound, as it ticked away the seconds, minutes, and the hours; the days, months, and the years. But he wrote of a clock of long ago. Today there stands a clock as equally majestic in the town of Cliffside. It isn’t like the grandfather clock in the song . . . it hasn’t been a part of Cliffside history for the traditional 90 years. It began its work for the town in 1919, and has chimed out the time for 50 years, this being it’s 50th birthday. And even though there is the tick-tock in the clock tower as the giant pendulum swings to and fro, it ticks away unheard by the life going on just beneath its giant hands. 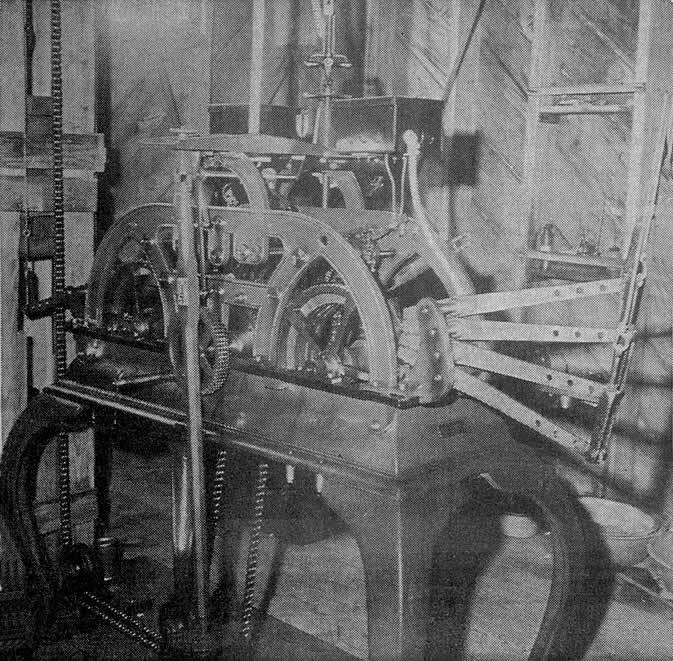 The remarkable old time piece is housed in the tower atop the R. R. Haynes Memorial Building and is a fascinating piece of machinery. 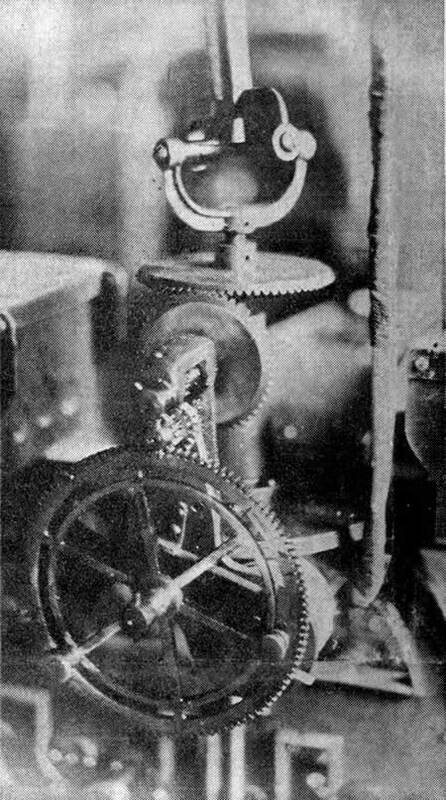 With three stories housing it works, the first one is the recorder of time—the time table (consisting of gears, chains, and levers, along with a three-foot pendulum that weighs in the neighborhood of 35-40 pounds) ticks off the time, and sends its message through one deck, all the way to the third story where the hands relay the message to the giant dials, and to mankind below. 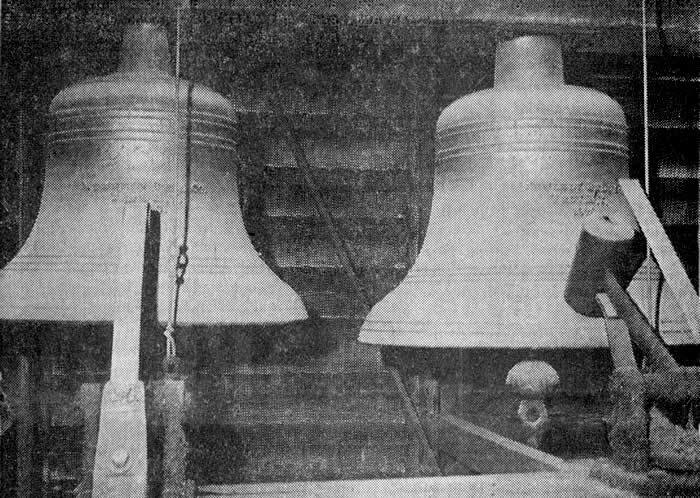 On the second story there hangs the magnificent old bells, four of them; varying in size from a small church bell to a giant monstrous cathedral type bell. And even though all parts of the clock are impressive, the bells are probably the single factor that give the giant clock its personality. On the hour, the quarter, the half, the three‑quarter, and then the hour again, the clock sends its resounding chimes throughout the streets of Cliffside, a sound that echoes and re-echoes up and down the wooded countryside that surrounds the small town. And some have said that when the wind is just right, the chiming of the town clock can be heard for as many as three miles away. The old clock has four faces (or dials) that face in each of the four directions. And for 50 years, citizens of Cliffside, the workers at the textile plant there and those who came and went during the days and nights looked up to the four faces as time’s story was told. And could the majestic old machine spin its yarn, it would have more stories to tell than any conversation piece in the town. Its stories would be numerous as fifty years have slipped by on the streets below. It has seen hard times come and go; and witnessed the coming of prosperous times. It has seen life come into the world and then tolled the death knell when life departed for other realms. The beautiful old structure has seen Cliffside’s young men march off to wars, has rejoiced as some of them came home and grieved or those who never returned. But faithfully, the big hands revolved daily, pointing to the giant-sized Roman numerals to tell the only story it can tell—the story of time. It has told its story through spring, the summer, fall and winter. And the four seasons have come and gone since it’s been there—its story of time could easily be classified as marking the four seasons of mar’s life. Spring—the time of birth and childhood; Summer—the time of growing up and assuming life’s responsibilities; Fall—the time when life begins Its process of withering; and Winter—the time when life comes to its final destination and the soul launches off on its journey into eternity. Yes, the old clock is graciously endowed with personality; and as the days pass on the streets below, thousands of eyes look up to its four faces to check the time. The clock’s story reminds man that he has places to go and times to be there. It tells him the time to go to work, and the time to get off from work. It chimes out a time to recline for rest; and chimes out another time to rise and greet the day. It has sadly watched funeral processions wending their way to the cemetery. It has watched parades and heard bands play. It has carefully watched a generation of children go by on their way to school, and now years afterward, it is a mute guardian to another generation. Now that our service men are returning from foreign lands, the old town clock seems to strike a fuller note to welcome them home. They, too, are surely glad to see the old clock, for it is a part of everything that means home, peace, and freedom. It means the little town where many of them were born and brought up, friends, neighbors, and loved ones. In loving memory of our boys who have made the supreme sacrifice and will not return to us, our clock will toll gently. And its chimes have tolled gently for 50 years, and who knows, perhaps in 40 more years when the clock has fulfilled its 90 years without slumbering, some song writer may compose a new song that will tell of his love for the old majestic Cliffside town clock. CAN YOU NAME THIS ONE? —It’s a strange looking machine, complicated by gears, levers, chains, weights, and you name it. 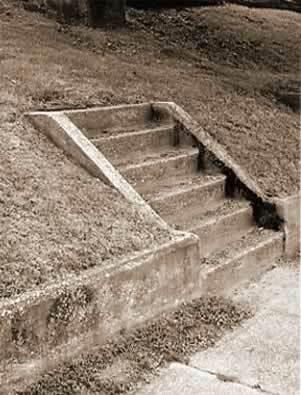 It was constructed in the early 1900’s by the E. Howard Company of Boston, Mass. If you want to know what it is, turn to the first page of the second section of today’s edition. Editor Troy Houser has compiled bits of information about an historic landmark in Cliffside. THE TIME TABLE—The story of time atop the R. R. Haynes Memorial Building in Cliffside begins the spinning of its yarn here. The Time Table, which stands approximately five feet in height, starts the process of relaying the message to mankind. The small dial (which reads 71/2 minutes after three) coincides exactly with the clock atop the building. 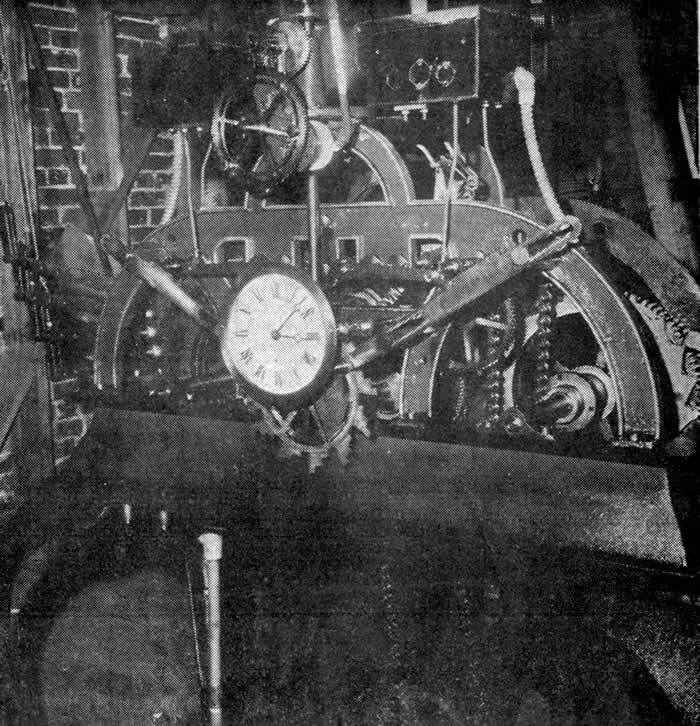 HEART OF THE CHIMES—Four levers point out, from the timetable, and are responsible for being the life-beat of the bells: On the hour, the quarter hour, the half hour, the three-quarters, then the hour again, these levers work their magic on the four bells. TIME’S JOURNEY BEGINS—This complicated mass of gears sits directly atop the timetable and the message of time begins its complicated journey to the top of the clock tower where time’s story is told. The intricate maze of wheels, chains, levers, and gears have combined forces to achieve their task for 50 years. Another 40 years and the songwriter’s traditional “90 years without slumbering” will be filled. CLOCK TOWER—Now in its 50th year, the majestic clock in Cliffside has chimed its message to mankind on the streets below. Even though the face of the clock appears relatively small, inside the clock tower, an average man could stand upright with room to spare on the inside of the face alone. 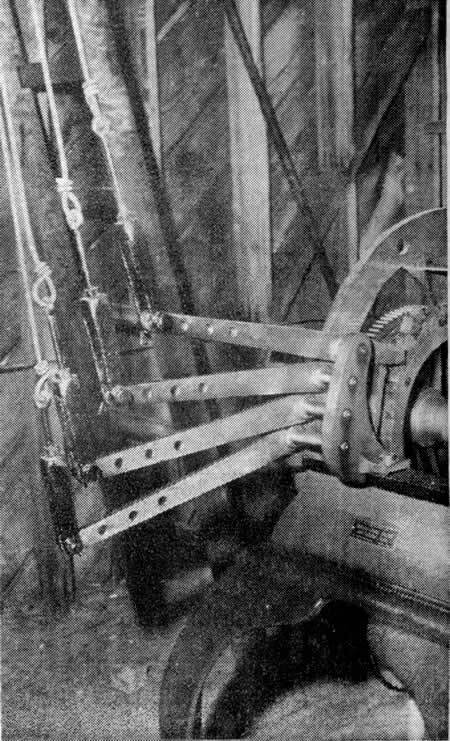 The dials are lighted at night by a circular construction of conduit, with regular household lights positioned strategically around.